If you can’t take the heat, get out of the volcano. That joke has almost certainly been (over)used at El Diablo restaurant in Lanzarote, where food is cooked with the geothermal heat from an actual volcano. Nestled in Timanfaya National Park in the Canary Islands, El Diablo hosts panoramic views of the Fire Mountains and was designed by local architect Cesar Manrique in the 1970s. The actual grill is an impressive piece of equipment. 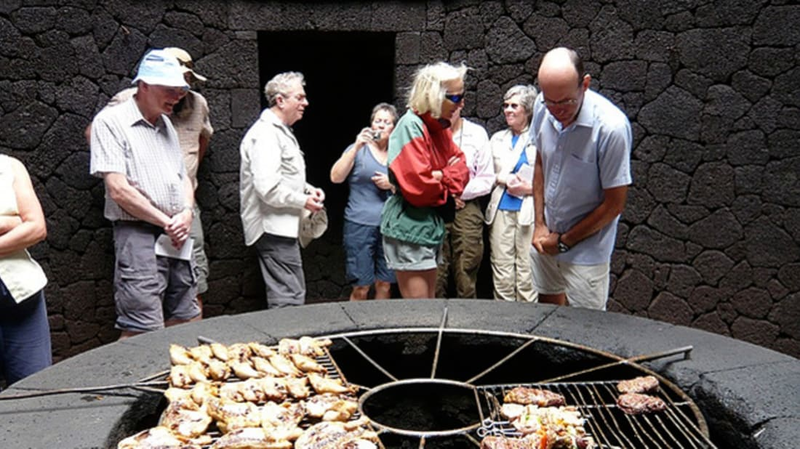 The cast iron rack rests on nine layers of basalt rock, where bubbling lava sits 6 feet down below. It stays a toasty 840+ degrees Fahrenheit all the time, and its existence is something of a geothermal anomaly. As for whether the volcano vapors are safe for cooking, manager Julio Padron told ABC that El Diablo consulted with scientists and volcanologists, who gave them the green light for the method. As for that other health concern—the one about a lava-filled dining room—it’s unlikely, but not impossible. The last volcanic eruption was in 1824, which means that it's still considered active, but ongoing scientific observation would provide ample warning should the volcano become threatening.